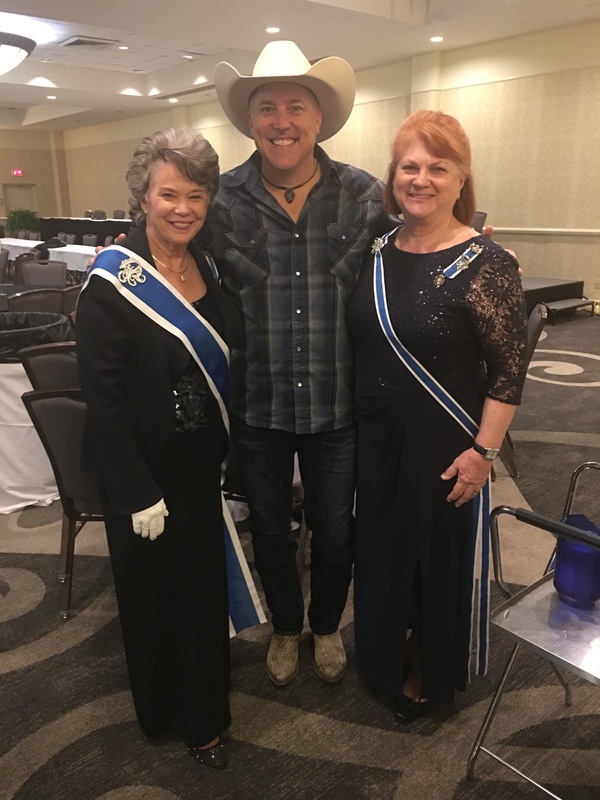 Leaving Tennessee, my next stop was Kansas City, Missouri where I was met by long-time friend, Karen Bradley and her sister, Cheri Earnest. The weather was drizzly and overcast, but felt warm and welcome as Karen and I reminisced about our time serving on the National Board of Management together. Susan Bowman, State Regent had planned a wonderful Conference with several workshops as well as events highlighting significant committees. For years I have been told not to miss the “Over the Hill” event, a talent show of sorts, following the Conference Banquet. It was truly a showcase of the Missouri Daughters having fun and incorporating their guests into the frivolity. Cheers and more cheers, to these members from the “Show Me” state. The Missouri State Conference was held on April 19-22, 2018, in Kansas City, Missouri. We were honored to have President General Ann Turner Dillon join us on Saturday afternoon through Sunday afternoon. The theme of the conference was “Moving Forward in Missouri.” Guests for the weekend were: Dawn Lemongello, Florida State Regent; Kathryn West, Kansas State Regent; Holly Blair, Massachusetts State Regent; Mary Frisch, Registrar General; and Christina Bannon, National Vice Chair America 250! Membership Task Force. Friday morning was busy with club meetings and a packed house for the Registrar Seminar, presented by Mary Frisch, Registrar General and Christina Bannon, Vice Chair America 250! Membership Task Force. The afternoon seminar was on Parliamentary Procedure, “The Rules of Debate” by State Parliamentarian, Linda Sehrt, PRP. A highlight Friday at the National Defense Luncheon, was speaker Lou Eisenbrandt, an Army Nurse that served in Vietnam from 1969-1970. From her recently published book, Vietnam Nurse, Mending and Remembering, she told of her experiences while serving in the war. 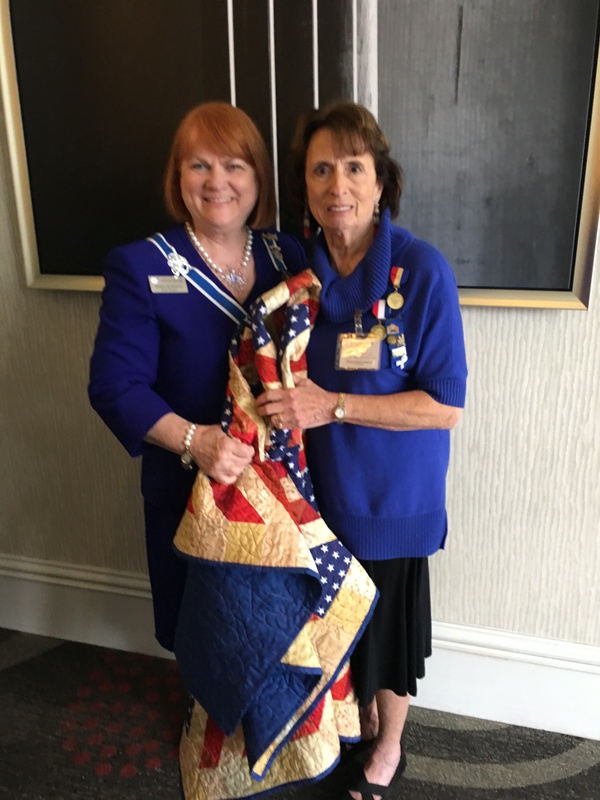 At the conclusion of the presentation she was presented with a Quilt of Valor in honor of her service to our country. Also at the luncheon, a JROTC Scholarship was presented to a deserving Missouri student. Friday evening was the Chapter Regents dinner and the graduates of the New Members and New Horizons Courses were recognized. After dinner at the Opening Night Session Dr. Kurt Graham, Director of the Harry S. Truman Presidential Library and Museum, spoke about Constitutional law. Saturday morning was the Junior Membership/DAR Schools breakfast, with special guest Jamie Burchfield, National Junior Membership Chair. Saturday Honors and Awards Luncheon was a full house with over 465 in attendance. Awards were presented to Good Citizens, American History Essay winners, Christopher Columbus Essay winners, several Missouri Scholarships, Outstanding Teacher of American History and the Lois Turner Allen Missouri Teacher of the Year Award. Saturday morning and afternoon also include business sessions. Mrs. Dillon presented 76 Chapters with certificates for 100% participation in the President General’s Project. The Outstanding Chapter and Outstanding Page were announced. At the Saturday night banquet, we were honored to have President General Ann Turner Dillon speak about the National Society. She was presented with charms for her bracelet and the Missouri Marie Oliver Award, for her service to God, Home and Country. Marie Oliver was the designer of the Missouri flag and a past Missouri state regent in 1913. Music entertainment was provided by Matt Snook, a country western singer, who appeared on Season 8 of The Voice. The evening concluded with the singing of God Bless the U.S.A., by Lee Greenwood. Sunday morning Mrs. Dillon hosted the Heritage Club breakfast and spoke about recent updates and the landscape project at Constitution Hall, which was made possible by donations from Daughters. A special Memorial Service honored those that have passed since last conference and we then finished a final business session and installed the new officers for 2018-2020 term. Many Missouri Daughters remained for an Italian buffet luncheon with the President General.